Feral Paws Rescue Group: We are an all volunteer, donation funded, 501(c)(3) non profit cat rescue: domestic, feral, seniors, and special needs kitties that are saved from high-kill shelters. All are fully medically vetted by our rescue Vets & will eventually be adopted to safe and loving forever homes. Those that do not get adopted will safely live at our rescue. 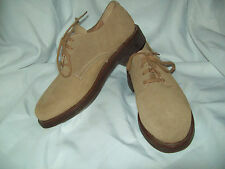 Ralph Lauren Polo Tan Suede Oxfords Size 9 1/2 D - Great condition!